Beautiful! Your little doll will love this girly gown! Details include a beautiful ruffled neckline with matching ruffled cap sleeve made of soft eyelet lace. Button front gown for easy dressing and ruffled hem of eyelet lace. 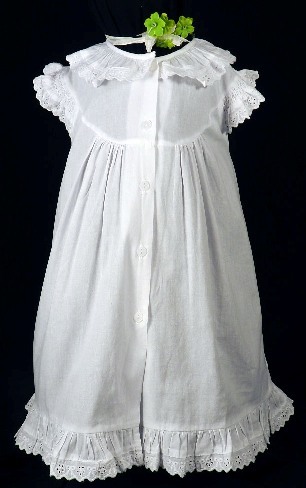 Sizes are based on age (example, size 1-2 is designed for an average sized 1-2 year old girl). If your child is smaller or larger than her peers, please adjust ordering accordingly.